Bonsai master Lloyd Noall has put this fantastic mega bonsai kit together which contains everything including a fabulous Medium size twisty trunked Chinese Elm bonsai tree. Easy to follow pictorial step by step guide, watch the online video with Lloyd doing what he does best - teaching the art of bonsai - then get stuck in! This kit is incredible value and great fun. It is ideal for beginners and would make a great gift. The Ultimate Bonsai Kit! 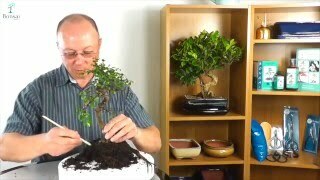 Fantastic Hands On Bonsai Pruning, Wiring and Re-Potting Kit. Fabulous way to learn bonsai techniques. This set is the perfect way to get started and develop your skills in the amazing art of bonsai, complete with step-by-step guides (Bonsai Pruning Guide, Bonsai Wiring Guide & Bonsai Potting Guide) and online bonsai tutorial videos. This is the perfect choice of indoor bonsai. It is a great size for a windowsill or desk and is easy to care for. It has fantastic shape trunk and immense character and the larger pot holds more water, making this bonsai easier to care for than its smaller counterparts. You will not be disappointed if you choose this delightful indoor bonsai tree! How do I re-pot and root prune my bonsai tree?